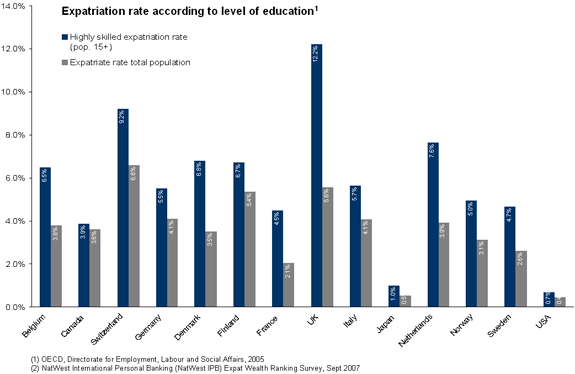 Expatriates from developed country tend to be highly educated. According to OECD statistics , the expatriation rate among highly skilled workers is generally higher than that of the average population. One of the most striking examples of “brain drain” are British expatriates: On average, 5.6% of the British population lives abroad as expatriates. This level of expatriation more than doubles to 12.2% among the highly skilled proportion of the working population. Put another way, more than one out of ten highly skilled British workers lives abroad! We blogged about Brits leaving the UK here. Many expatriates earn a high income. The average annual income of British expatriates was £67,000 (~€80,000) in 2007, or 43% above the UK average (NatWest IPB Expat Wealth Ranking Survey, 2007). 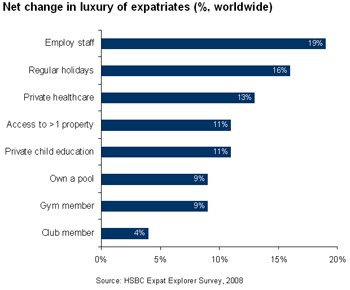 More than 30% of expats earn expatriate salaries in excess of £100,000 (~€120,000) per year (HSBC Expat Explorer Survey, 2008).In addition to their salaries, many expat also receive special expatriate benefits that go significantly beyond the benefits of other employees. These can include relocation help, accomodation benefits and special family benefits such as financial support for private schooling. Due to their higher than average incomes and addition support from employers, many expatriates experience a more luxurious lifestyle abroad than at home. More than half (58%) of expatriates save and invest more money abroad than in their home country - despite spending more money abroad than at home. After their move abroad, expatriates tend to spend more on food (+25%), shopping (+22%), accommodation (+18%) and socialising (+15%) (HSBC Expat Explorer Survey, 2008). Nevertheless, their expatriate benefits often allow them to enjoy luxuries abroad that they didn’t have at home, such as private health care and private education for their children. When moving abroad, expatriates face a range of challenges. Many expats do not speak the local language of the country they’re living in, although an increasing percentage tries to learn it. This language barrier makes it harder to deal with local service providers, thus generating a need for specialized services. Despite their language problems, an increasing number of expatriates try to make friends within local communities, which goes against the stereotype of the “typical expat” that doesn’t try to integrate into the local society.